I make this simple (but time consuming) dish for Passover every year. It’s not a Passover dish persay but it’s become a tradition. Some of my guests count on it being there. Use quality ingredients and watch the cooking methods and this dish will be perfect. Otherwise, it can be bland or just really off. Start the dish the day before, or at least early in the morning. You can make this with white mushrooms, but I don’t recommend it. They have a lot of water and it takes forever to simmer it off (losing flavor as you do so). But be careful with the brown mushrooms too…I didn’t realize this but the Costco ones are almost as watery as white button mushrooms (this is what you see in the pictures). My preference is to get them organic from the United Foods buyer’s club but, when they aren’t available, I just get them (non-organic) from the bulk mushroom bin at Whole Foods. The sage must be fresh, not dried. The olives need to have flavor, so no canned “Mission” olives (they are green olives that are over processed and turned black chemically). 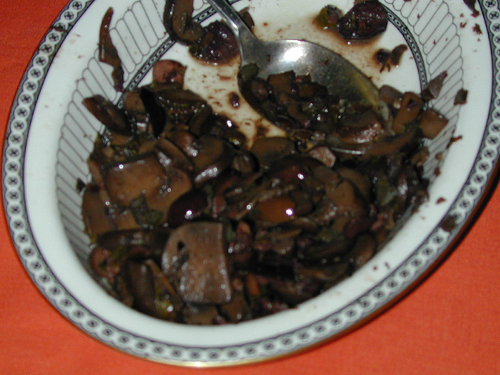 I use Kalamata usually but have also made it with other black olives. Pitted saves you a ton of time, but you can use whole in a pinch. Makes enough for a side dish for 15-20 people (or 8-10 if there aren’t other side dishes). Note: This recipe is for watery mushrooms. 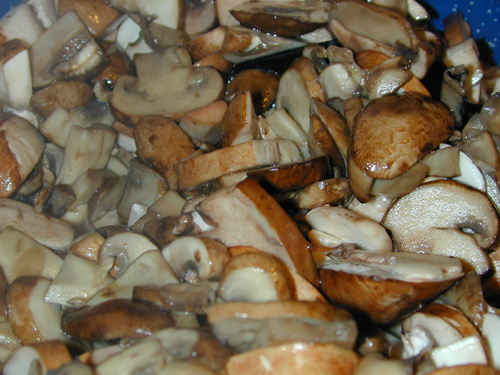 If you are lucky enough to get nice dry ones, you can cut the amount of mushrooms you use by a third or more. Or increase the other ingredients. 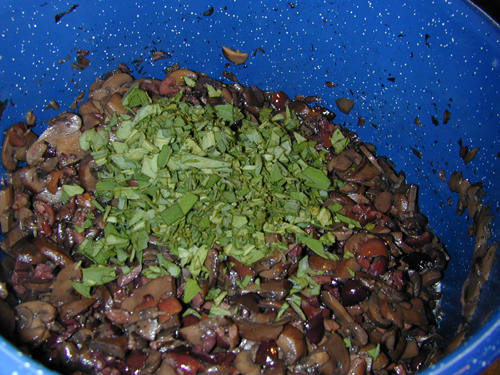 When the mushrooms have started to become glossy and lose that raw look (5-10 minutes or so), add some salt. This will draw out the water. 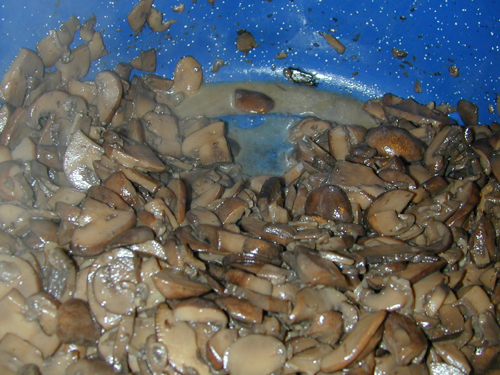 White mushrooms (and cheap brown) will bring out a lot of water. Now comes the tedious part. 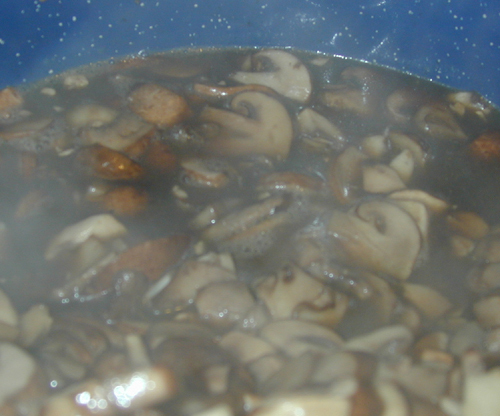 Keep the mushrooms at medium heat (simmer but don’t boil) and stir often. Don’t cook for longer at lower heat; you will lose a ton of flavor. It will take a couple of hours to get the water off so they look like this. At this point, you are probably tired, so turn off the heat, cover, and leave until the next day. They’ll be fine. Note: if you start with quality crimimi mushrooms, you will only have to cook them for about an hour, you’ll end up with a much larger amount, and they’ll have more flavor. With the pan hot, add the sherry or wine (sherry has a nicer flavor, but is hard to find kosher). Stir and let that burn off. Cook on low heat until everything is warm and the flavors meld. Adjust for salt. You can turn off the heat at any point and let the pot sit there. Just before serving, reheat. This dish keeps well in the fridge and can be reheated several times.